The University of Central Arkansas Center for Community and Economic Development partnered with the Greater Searcy County Chamber of Commerce to unveil a new brand and logo for the county. The branding project between UCA and the Greater Searcy County Chamber of Commerce was initiated following feedback from a UCA marketing course in which students advised Searcy County chamber officials on their branding and marketing efforts. “We are excited to use the feedback from the students, along with the creative inspiration of LaGrone Design, to bring this new brand to life for the Searcy County Chamber,” said Amy Whitehead, director of UCA Center for Community and Economic Development. The logo showcases the Ozark Mountains, the Buffalo River and a multitude of other waterways in the County. It’s topped by a sun emitting rays, which speaks to the energy and commitment found within the county by its people. The tagline “Always in Season” reinforces the idea that there is always something going on in Searcy County. The new brand and logo will be a tool that citizens and leaders can rally behind for future business recruitment and tourism efforts. 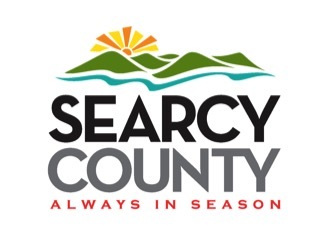 “Searcy County is clearly one of Arkansas’s most beautiful places and this new logo and slogan will help us better realize our economic potential by enhancing the marketing of our Ozarks home to potential new residents and businesses, vacationers, the vacation home market and locals who now live elsewhere,” said Darryl Treat, Searcy County Chamber of Commerce president. “We in Searcy County owe a debt of gratitude to the wonderful students at UCA who offered their enthusiastic support for this project, as well as UCA’s Center for Community and Economic Development and the great design expertise of Mr. Pat LaGrone at LaGrone Design,” Treat explained.